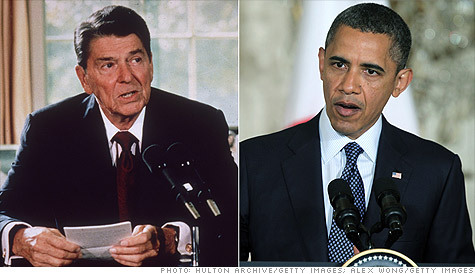 President Reagan and President Obama: A tale of two recoveries. NEW YORK (CNNMoney) -- April's jobs report was, in a word, disappointing. The economy added only 115,000 jobs. Hiring slowed. More than 340,000 workers dropped out of the labor force. April's report, which follows lackluster numbers for March, is particularly bad news for President Obama's campaign staff in Chicago. Election forecasters have long argued that a swiftly improving economy in the months leading up to Election Day represents Obama's best chance for an easy re-election romp. After all, that's the playbook Ronald Reagan used to steamroll Walter Mondale in 1984. Reagan was able to capture a whopping 525 electoral votes, in part because the economy was rapidly climbing out of a recession as voters went to the polls. But now, it looks like the Obama team will have to set aside hopes of a Reaganesque recovery. That's because job growth is following a familiar pattern: strong in the winter, weak in the spring. A few months ago, it looked like the labor market was starting to gain some traction. The economy added 200,000+ jobs from December through February. That momentum appears to be lost as the economy added only 154,000 jobs in March, and 115,000 in April. Even worse, the portion of the adult population participating in the job market is now at its lowest level since 1981. The slowdown mirrors trends that were also seen in 2010 and 2011, when job growth registered several months of solid gains before slowing. Things were different in 1984. In April 1984, the economy added 363,000 jobs. In the first four months of 1984, employment growth hit 1,564,000. This year, the first four months have brought about half that amount. And the Reagan recovery sustained its momentum through the election, averaging 300,000 new jobs a month from May to October. For the full year leading up to November 1984, the economy added 4.1 million jobs. To match that total, Obama would have to add 440,000 jobs every month between now and Election Day. Republicans, of course, are eager to cite the employment report as evidence that the president's economic policies aren't working. "We should be seeing numbers in the 500,000 jobs created per month," Mitt Romney said Friday morning. "This is way, way, way off from what should happen in a normal recovery. But this isn't a normal recovery -- and it wasn't a normal recession. Another difference: With comparatively small debt loads, Reagan was able to push through a 23% across-the-board cut of individual income tax rates. Obama, meanwhile, entered the presidency with substantial budget deficits and an economy contracting at a rate of 6.7%. Obama is unlikely to match Reagan on another key measure often used in political rhetoric: the unemployment rate. In April, the unemployment rate dropped to 8.1%, and almost a full 2% has been lopped off the indicator since it peaked at 10% in October 2009. At at this point in Reagan's first term, the unemployment rate was 7.8%, down from a peak of 10.8%. He ultimately was elected when unemployment was 7.2%. Of course, some political scientists say a more useful predictor of electoral success is the general economic trend and how Americans feel about the economy. And there, the White House has both good and bad news to consider. According to a CNN/ORC International survey conducted last month, the number of Americans who think things are going well in the country is on the rise. According to the poll, 43% say things are going well, up a slight three points from February, but up a dramatic 19 points from last August. But the survey also indicated that nearly six in ten still say that conditions are bad and that most people don't believe the economy has started to recover.